These hosts will be at the Festival, will you? 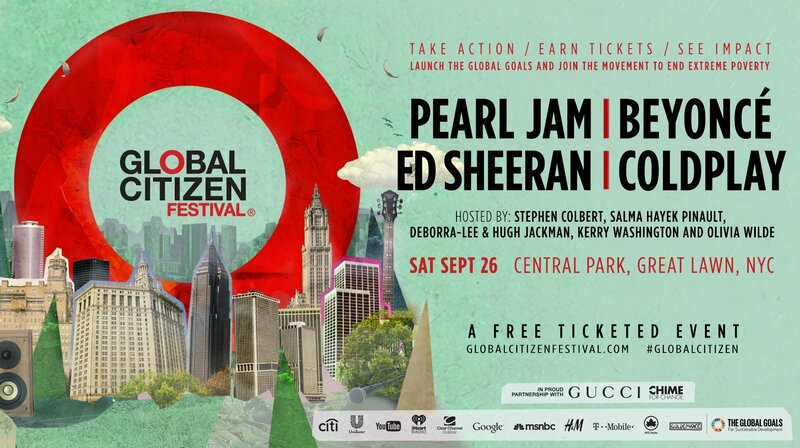 The lead hosts of the 2015 Global Citizen Festival have been announced and it’s an incredible lineup: Stephen Colbert, CHIME FOR CHANGE co-founder Salma Hayek Pinault, Deborra-lee and Hugh Jackman, Kerry Washington and Olivia Wilde. For fun, check out the video above with Stephen Colbert and Hugh Jackman talking about the Festival. This amazing group of talent is joining Pearl Jam, Beyoncé, Ed Sheeran and Coldplay on September 26th in New York City’s Central Park. And broadcasting the events live on stage will be msnbc with hosts Willie Geist, Janet Mock and Alex Wagner, while Tamron Hall will host a one hour television special of the event. And online, YouTube will be livestreaming at YouTube.com/GlobalCitizen with hosts asapSCIENCE and Matthew Santoro, all presented by T-Mobile. And in case that front-of-house talent wasn’t impressive enough, it should be noted that the entire Festival is being produced by Emmy Award-winning producer Ken Ehrlich (you know, the guy producing the Grammy Awards). This awesome assembly of talent and influence is coming together to end extreme poverty and they hope you will be joining them. To earn free tickets, you can go to the 2015 Global Citizen Festival page and take action. To hear just how important this is, watch this video from 2015 Global Citizen Festival lead host and CHIME FOR CHANGE Co-Founder Salma Hayek Pinault. Well said. Now global citizens, it’s your turn. Get involved in the newly released Global Citizen Festival Action Journey 3, or go back and take Action Journey 1 or Action Journey 2 to earn a chance at FREE tickets. The 2015 Global Citizen Festival will be packed with music and talent, now it’s your job to make sure the stage is filled with the political commitments the world needs to end extreme poverty by 2030. Go to the 2015 Global Citizen Festival page, take action, earn tickets and change the world.